Tweet to Turn It On! Get your hashtag game ready for an interactive art experience. WHERE IS THE DUMBO REFLECTOR TODAY? In the Shop - will be back soon! Or, Just Watch it Work. The Reflector indicates traffic on the 9s (M=Manhattan Bridge / B=Brooklyn Bridge), weather on the 1s and it's also a binary clock! Use it as a Magic 8 Ball! #DUMBOMagic – an ultimate decider feature, which delivers a “magic eight ball”-style randomized display to help anyone sort through pressing issues of the day using color-coded animations. Take the Brooklyn Bridge over the Manhattan Bridge in this instance. 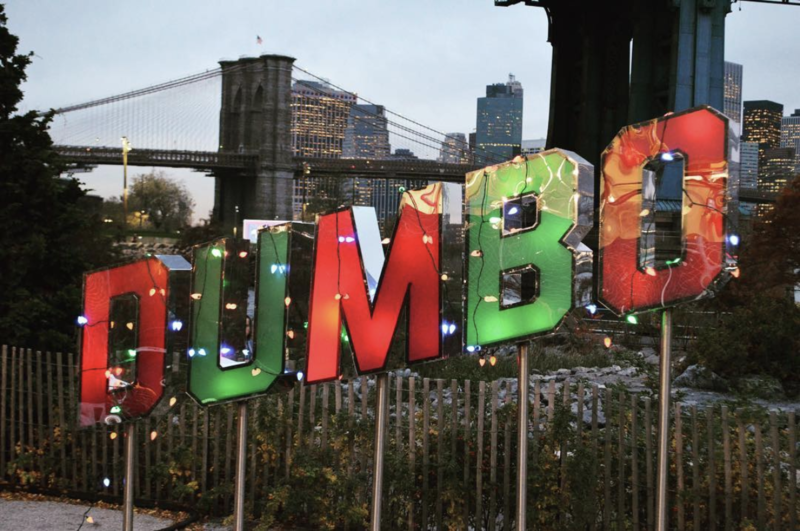 The interactive DUMBO Reflector, commissioned by the DUMBO Improvement District in honor of its tenth anniversary in 2006, serves as both a technologically advanced welcome sign, and a celebration of the artistic culture and tech-forward legacy of DUMBO. The creation of the sign, by DUMBO-based multimedia artist David Crumley, utilizing the iconic neighborhood logo spelling out “DUMBO” by smartassdesign, is part of DUMBO’s Test Kitchen program. Did you know? 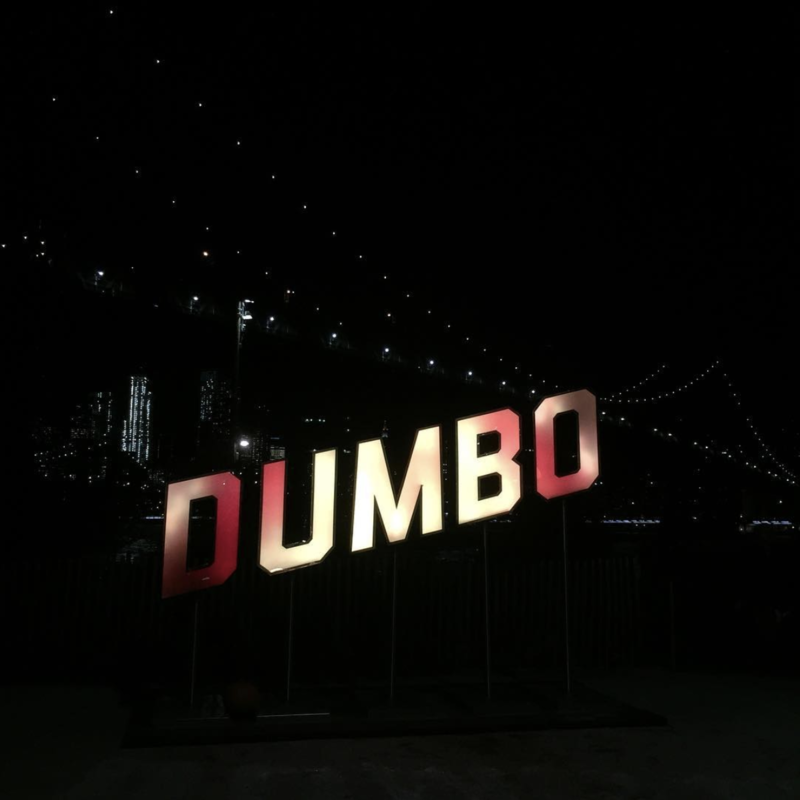 Our iconic Dumbo logo was designed by smartassdesign, right here in Dumbo. The DUMBO Reflector shows the spirit of the neighborhood in both static and dynamic forms, and measures twelve feet wide by nine feet tall. The surface of the letters on the sign are mirrored, and the sign can come to life instantly with various animations and light patterns through the usage of social media hashtags, which can be programmed to reflect topical issues or community events. The first programmed hashtags include #DUMBOselfie and #DUMBOwedding (nods to the neighborhood’s status as one of New York City’s premier spots for photography); #DUMBOMagic – an ultimate decider feature, which delivers a “magic eight ball”-style randomized display to help anyone sort through pressing issues of the day using color-coded animations. Additional features of the DUMBO Reflector include a binary clock, which keeps time on the hour; traffic status information delivery for the Brooklyn and Manhattan Bridges using data from the New York City Department of Transit (and also available on demand using #DUMBOTraffic); and the distribution of weather information every ten minutes using data from Darksky. The installation is constructed from DIBOND mirrored aluminum composite, acrylic two-way mirrors, and stainless steel supports, and it is lit from within by 400 Enttec RGB LED Dots connected to an Enttec Pixelator. Two custom software applications—a cloud server for remote administrative control and a local application, developed in TouchDesigner, to send content to the installation—were created to drive the Reflector's content and interactivity. The two applications are able to communicate bi-directionally using WebSocket objects and JSON data. Following its debut at Brooklyn Bridge Park, where it was the first ever art installation at the newly opened John Street section, the sign now travels throughout the community.